The latest Global Cloud Index (GCI) 2016-2021 from Cisco focuses on the worldwide market outlook for enterprise data center virtualization and cloud computing services. Today's digital business is enabled by Hybrid IT infrastructure that supports the deployment of cloud-based solutions. Driven by the surging enthusiasm for digital reinvention projects, data center traffic is growing fast. 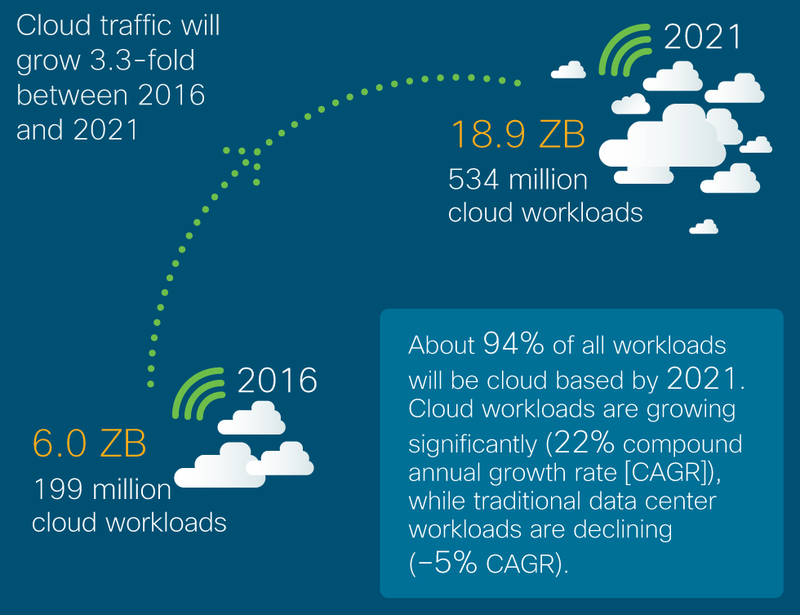 The market study authors forecast global cloud data center traffic will reach 19.5 zettabytes (ZB) per year by 2021 -- that's up from 6.0 ZB per year in 2016. Globally, cloud data center traffic will represent 95 percent of total data center traffic by 2021, compared to 88 percent in 2016. Additionally, according to the Cisco assessment, the growth of Internet of Things (IoT) applications requires scalable server and storage solutions to accommodate new and expanding data center demands. By 2021, Cisco expects IoT connections to reach 13.7 billion -- that's up from 5.8 billion in 2016. By 2021, 94 percent of workloads and compute instances will be processed by cloud data centers. In contrast, 6 percent will be processed by traditional IT data centers. Globally, the data stored in data centers will nearly quintuple by 2021 to reach 1.3 ZB by 2021, up 4.6-fold (a CAGR of 36 percent) from 286 EB in 2016. Driven largely by IoT, the total amount of data created (and not necessarily stored) by any device will reach 847 ZB per year by 2021, up from 218 ZB per year in 2016. Data created is two orders of magnitude higher than data stored. By 2021, 75 percent (402 million) of the total cloud workloads and compute instances will be SaaS workloads and compute instances, up from 71 percent (141 million) in 2016. (23 percent CAGR from 2016 to 2021). By 2021, 16 percent (85 million) of the total cloud workloads and compute instances will be IaaS workloads and compute instances, down from 21 percent (42 million) in 2016. (15 percent CAGR from 2016 to 2021). By 2021, 9 percent (46 million) of the total cloud workloads and compute instances will be PaaS workloads and compute instances, up from 8 percent (16 million) in 2016. (23 percent CAGR from 2016 to 2021).